It's frustrating when you can't easily find what you need. Rummaging for a measuring tape inside a nest of pens tangled in rubber bands? That drawer needs clutter busting. 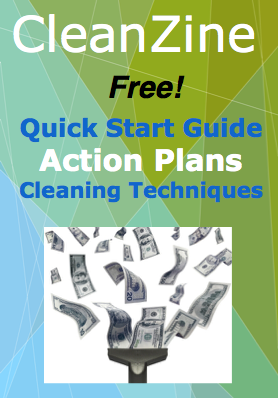 One excellent way to increase your cleaning business profits is to offer an organizing service. A lot of people are downsizing or asking themselves when enough stuff is simply TMS—too much stuff. Professional organizers offer a valuable skill. They specialize in de-cluttering everything from junk-drawers to family photos to income taxes. Professional organizers can order physical items in households and offices, such as the insides of filing cabinets, closets, cupboards, and drawers. They may specialize in cleaning up and sorting computer files. Online accounts, household receipts, business records, financial statements, and medical records all need organizing. This includes physical files and files stored in the cloud. As society increasingly files information electronically, new skills are needed to organize those files. Are you eager to expand the types of cleaning services you offer? Take the next step. Offer clutter busting and organizing tips for your customers right on your website. Be sure your tips are quick to scan and useful. Position yourself as an expert, which lends you authority and communicates your value. Tell your customers about the organization services you offer. Include your new and expanded services on social media, and put it on your flyer. Why not make a separate flyer--with your top 10 organization tips included--and advertise your organizing service? - Busy working parents and professionals who lack time. - Any homeowner who has recently moved, or is about to. - Boomers downsizing from a large home. Someone who has recently inherited an estate. - People who work from home. Most people have a home office, even if only a desk and a filing cabinet. Not everyone has gone paperless yet. Papers have a way of piling up and incrementally getting out-of-hand. A typical filing cabinet can hold around 18,000 pages. Saving those physical papers had better be important. If not, they should be tossed. Or better yet, shredded. Why not provide a shredding and recycling service to your organization and cleaning skills? Make your service invaluable to busy professionals. An “organization” service is an umbrella title. Basically, it covers de-cluttering, coordinating, and systemizing things. To some, these skills come naturally. But plenty of people are lousy at them and will pay for assistance. Clutter-busting has benefits beyond the increased paycheck. Adding a professional organizing service to your list of skills lends variety to your workday. Multiple skills make your service more valuable. Clients are more likely to want to engage you in a long-term working relationship. Help your clients untangle that measuring tape. Think of ways to save your customers time and effort. Follow this rule-of-thumb and gain the edge over your competition. Free your clients of TMS, and you will create a more secure, valuable cleaning service.